Running an eCommerce or brick and mortar store inventory can be tough, but there are solutions to this problem. EMERGE App is a cloud-based management solution, designed to help small businesses keep track of their inventory, keep track of products and item records. Keeping track of inventory is what breaks or make you small business, it helps to streamline your productivity and also make sure you have all the numbers aligned to match your sales goals or customer orders. Inventory management is the core of any small business. Keeping accurate records is vital to managing expenses, meaning buyer confidence and tracking all sales that go through. Today, small business still don't get the importance of streamlining their inventory. Some small business depend on excel spreadsheets to manually enter data that could have been automated. Spreadsheets have long been a trusted method for data entry and tracking inventory but now this is fading out as they become less efficient. The right inventory management software should allow businesses to keep track of their sales, buying data and trends to identify ways to save money fast while accelerating sales. 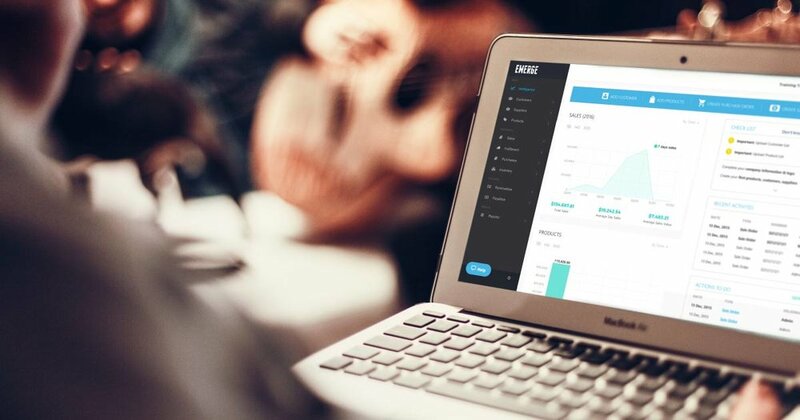 To ease the struggle of finding an inventory management software, the EMERGE App was developed to make inventory management efficient, fast and easy for small businesses. EMERGE App in action. This is a simple review of this app and how it can make your small business more efficient, cut cost and track your business stock with precise accuracy. This is one of the best small business inventory management solutions that can be used by anyone within an organization. To understand why EMERGE app is one of the best in inventory management, there are five significant features that stand out, these include; real-time data collection, instant access to up to date product information within a dashboard portal, updated purchase information for each item, accurate inventory levels and supplier-specific purchasing details all-in-one app. The real-time data allows businesses to find customer, supplier and product information instantly in the app. Even historical and analytical data is available in easy to understand, graphical form which helps businesses immediately identify trends and review and track their spending over time. Access to product information helps users locate the available products and their prices. Quotations can even be generated based on that information and then sent out directly to customers using the EMERGE App. These actions update other information in the app, in real-time. Updated purchase information like purchase price and landed cost (the total amount of a product, accounting for the original price, transport fees, customs, taxes, etc.) helps businesses understand the actual value of their shipments and identify opportunities to lower costs. Since no manual calculation is needed, there are no mistakes in calculation, and enterprises waste less time and money. Real-time inventory levels will help businesses keep track of their inventory in real time and avoid overstocking or understocking goods. In the end, this helps a company's bottom line since they won't run out of fast selling stocks, identify appropriate stock levels before repurchasing and alter prices to reflect an interest in a particular stock. One of the most improtant features is, purchasing details specific to supplies like supplier prices and lead time will help businesses buy stock items more efficiently. All of the supplier specific information will be saved to the same location so it can quickly be reviewed and accurate documentation can be generated. Upon logging in, businesses will see the stunning visual graphs and purchase data on their Dashboard. The Dashboard and all other information are customized to the business so during the sign-up process, which is as simple as submitting an email, business address and company name, etc., the main user can set preferences. Among these preferences will be accessing information, which details who has access to the app and what they have access to. Once those preferences are set, and product and supplier information are updated, the stats on the dashboard will match company purchasing and inventory trends. Various expandable categories are listed on the left side of the page, including Dashboard, Customers, Suppliers, Products, Sales, Fulfillment, Purchases, Inventory, and account specific options like Receivables and Payables. When information is updated, or actions are done in the app (like creating a new sales order), the app updates all other categories automatically. So if a user creates a new sales order under the Products section by clicking on the drop-down list, the number of products added to that order is automatically deducted from the available inventory. When looking at the "In Stock" figures, then, businesses can view their available stock excluding the purchase order that was drafted (even though it has not yet been received) as well as the available inventory including the purchase order but excluding any existing orders that are awaiting delivery. The former figure is useful to ensure that stock items are not depleted or replaced inappropriately by keeping up to date information on the items that will be available after all sales are finalized. The latter figure is useful when there are upcoming sales that have to be accounted for, but the delivery date is not yet known for the items included in the sales. To issue purchase orders for new stocks, the user can go to the Purchases section of the app and click the appropriate drop-down options, that's it! The app automatically updates stock and inventory information, so businesses always know how much they have. If a user needs to manually manipulate the inventory information, for instance, if stocks are damaged and must be thrown out or if stocks need to be rehoused in another location (yes the app even keeps track of stock location! ), they can go to the Inventory option on the left. From the Inventory tab, users can also see the overall number of items in inventory and their sales stock. All of this information can easily be transferred into official reports for record-keeping or auditing purposes, again saving time and money. With all the simple and easy to use features, EMERGE App also has comes with a B2B eCommerce platform that is offered free of charge with your account. It makes B2B communication easier between wholesalers and customers, enabling retailers to log in to their purchasing accounts, find goods they need and check out themselves, eliminating the extra hassle and intermediaries that usually slow down the transaction process. EMERGE App is priced right at under $30.00, the EMERGE App provides businesses with an affordable and efficient way to keep track of business inventory. It ultimately helps to ease the process of updating inventory and stock manually, as EMERGE will automate these tasks for you in app, keeping accurate records and visualizing analytical data instantly all-in-one software. The app is a must have for small businesses who care about keeping accurate transnational and business records, digitizing their data and making it easier for teams to access and update company inventory. With intuitive apps like the EMERGE, you small business gets what it needs to grow and be profitable, while cutting wasteful spending.